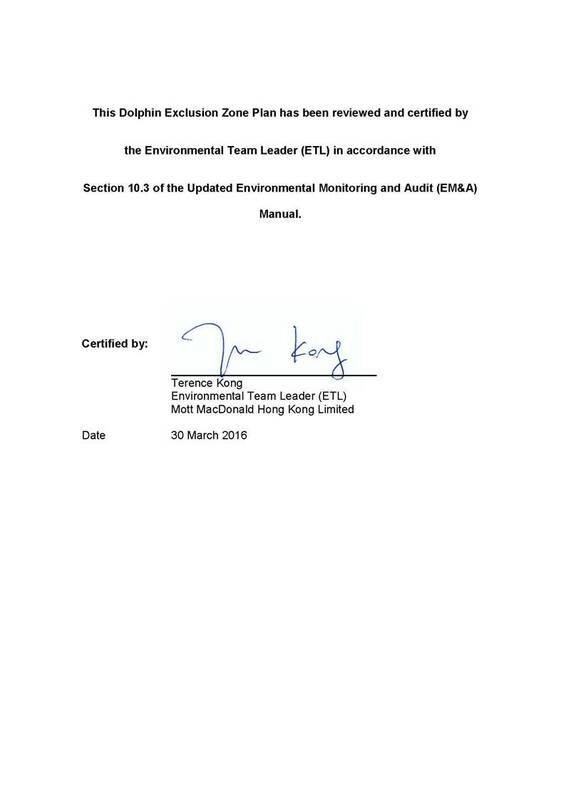 Under the Environmental Impact Assessment Ordinance, the Environmental Impact Assessment (EIA) Report and the Environmental Monitoring and Audit (EM&A) Manual (Register No. 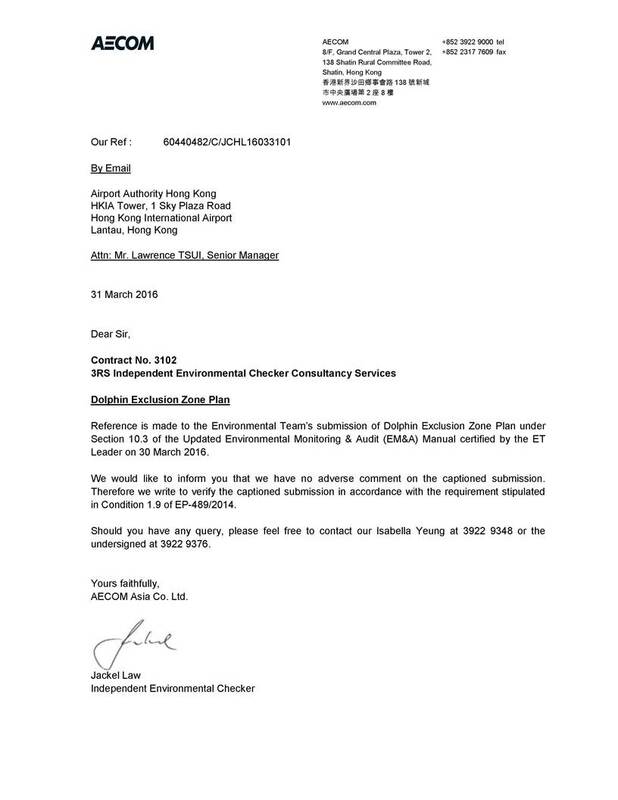 : AEIAR-185/2014) prepared for the “Expansion of Hong Kong International Airport into a Three-Runway System” (the project) have been approved by the Environmental Protection Department (EPD), and an Environmental Permit (EP) (Permit No. : EP-489/2014) has been issued for the project. Pursuant to Condition 2.31 (viii) of the Environmental Permit (EP), the Airport Authority Hong Kong (AAHK) should establish a 24-hour dolphin exclusion zone with a 250m radius from the boundary of marine works. Mott MacDonald Hong Kong Limited (MMHK) was appointed by AAHK to provide environmental consultancy services to establish a Dolphin Exclusion Zone (DEZ) Plan to be implemented for marine works during the construction phase of the project. According to the EIA of the 3RS project, the impact significances of acoustic disturbance from daytime and night-time reclamation related construction works have been evaluated as “Low-Moderate” and “Moderate” respectively. DEZ, which has been adopted in Hong Kong in other previous projects involving noisy marine works, is proposed as a precautionary and mitigation measure respectively for acoustic disturbance impacts of daytime and night-time marine construction works. Noisy marine construction activities might cause behavioural disturbance (e.g., disturbance to communication and echolocation) or even physical harm to cetaceans. This DEZ plan should identify the actual marine construction activities that require the implementation of DEZ based on an objective assessment of noise levels and noise intensities from different marine construction activities. However, detailed designs of the construction works are unavailable at the time of preparing this DEZ Plan. This DEZ Plan is prepared as a precautionary and mitigation measure for Chinese White Dolphin and in accordance with Environmental Permit (No. EP-489/2014) Condition 3.1 (v) requirement and the Updated EM&A Manual for the 3RS Project to provide detailed implementation of dolphin exclusion zone. The DEZ Plan shall be submitted to the EPD for approval at least 1 month prior to commencement of construction activities requiring DEZ. Given the scale and complexity of the project and the fact that a number of key project components are still subject to detailed designs and employment of Contractors before implementation, this DEZ Plan provides the general specifications and requirements for the implementation of DEZ monitoring which shall be adopted by all relevant Contractors under the 3RS Project. Each Contractor has to prepare a method statement on how to implement DEZ Plan according to the specifications and requirements of this Plan with detail arrangement and setting of the dolphin observation platform for certification by the Environmental Team (ET) Leader of the 3RS Project and verification by the Independent Environmental Checker (IEC) of the 3RS Project prior to commencement of the marine works that require DEZ. § Bored pilling for approach lights and marker beacons. If the design team or construction contractor is able to demonstrate that certain equipment / marine works activity is not noisy or generates only low noise disturbance (e.g. in a noise assessment done during an equipment trial before full scale works), the consultant / contractor may then seek confirmation that DEZs for that particular equipment / marine works activity are not required (subject to review and approval by AAHK, the ET, the IEC, the EPD and AFCD). A DEZ with 250 m distance from the boundary of the works area shall be established during all periods of each of these marine construction activities. An indicative DEZ is provided in Figure 1 for reference. The DEZ serves as a short-term approach to provide appropriate and immediate action should dolphin be sighted within the DEZ for construction activities requiring DEZ. § Exact location of elevated platform on the barge with unobstructed view of the DEZ. Should Contractor(s) propose alternative approach or plan achieving similar objectives of DEZ monitoring, the proposed approach/plan shall be reviewed and approved by AAHK, ET and IEC. The Contractor’s Method Statement for DEZ Monitoring shall be submitted to the ET Leader of the 3RS Project at least three weeks prior to commencement of construction activities of the Contract and subject to update and review as necessary. DEZ monitoring stations shall be setup to cover the 250 m distance from the boundary of all construction activities that require the implementation of DEZ. Each monitoring station shall be located on a stationary barge or vessel, depending on the type of construction activity, at a platform with an unobstructed, elevated view of the DEZ. The barges/vessels selected for DEZ monitoring stations shall be reviewed and updated based on actual locations of the barges/vessels relative to the distribution of works that require implementation of DEZ at the site. § At least two dolphin observers on duty to carry out the DEZ monitoring work in rotation (e.g. rotate observer every 30 minutes) in order to minimize fatigue. The dolphin observers shall be trained by qualified dolphin specialist of ET or with certification by suitably qualified dolphin specialist to demonstrate with relevant experience. Preferably with a degree in biological sciences or equivalent, experience in observing dolphins, and basic knowledge of marine mammals in Hong Kong. The dolphin observers shall be appointed by, but independent of, the Contractor. The Contractor shall propose candidates of dolphin observers for AAHK, ET and IEC to review and approve. The dolphin observers shall also conduct regular competence checking on the effective implementation of the DEZ by the ET. It is of crucial importance that dolphin observer shall have the power to call-off construction activities when dolphin is identified within the DEZ. The DEZ shall be scanned by the dolphin observer with naked eyes and occasionally with the aid of binoculars for confirmation. During night-time monitoring, night vision devices (NVDs) shall be used when little or no lighting on sea surface is available. Marine binoculars with built-in compass (e.g. Steiner Navigator 7X50 HD-stabilized Compass, or model with similar or more advanced specification) shall be used during day-time monitoring. Night vision device (NVD) shall be used during night-time monitoring. The NVD is suggested to be in the form of hand-held, head-mounted or tripod-mounted units depending on the location of the DEZ monitoring station. A NVD from ATN, model PS15-CGTI Night Vision Goggles, with 3X lens, has proved practicable for night-time DEZ monitoring undertaken during the Deep Cement Mixing field trial. Therefore, the same model or NVDs with similar or more advanced specification and performance shall be selected for night-time DEZ monitoring based on availability in the market. All selected NVDs shall be tested before actual use for night-time DEZ monitoring. The tests shall be conducted by experienced dolphin-monitoring researchers, preferably at a site or sites where dolphins occur with regularity, and can be tracked by theodolite in the late afternoon hours, so that visual day-time tracking can be “handed off” to night-time NVD sighting as darkness descends. All the tests shall be witnessed and verified by AAHK, ET and IEC. Only after such dedicated testing has provided confidence that the NVD technique allows for reliable detection of dolphin at night shall the use of NVD be adopted. The feasibility of using Passive Acoustic Monitoring (PAM) involving the use of hydrophones or automated cetacean detectors with real-time data capability will be explored for the Dolphin Exclusion Zone monitoring in case the NVD is found to be ineffective for night-time CWD detection. Prior to the commencement of construction activity, the DEZ shall be scanned thoroughly by dolphin observer for any presence of dolphin for an initial period of 30 minutes. Construction activity shall only be commenced after the dolphin observer has confirmed that the DEZ is clear of dolphin for the initial period of 30 minutes. The dolphin observer shall then inform the construction superintendent through mobile phone or handheld transceivers to certify the commencement of construction activity. The DEZ monitoring shall continue throughout the period for all active construction activities requiring implementation of DEZ. When dolphin is detected by the dolphin observer within the DEZ, the dolphin observer shall inform the construction superintendent immediately through mobile phone or handheld transceivers to cease construction activity within the DEZ. Construction activity shall not be re-commenced until the dolphin observer confirms that the DEZ is continuously clear of dolphin for a period of 30 minutes. The dolphin observer shall then inform the construction superintendent through mobile phone or handheld transceivers to certify the re-commencement of construction activity. As there could be a number of Contractors working at the same time for the project, a full contact list of DEZ monitoring team representatives and all construction superintendents at the site as well as representatives of ET, IEC and AAHK shall be prepared, updated regularly and circulated to all parties involved in the DEZ monitoring. With a full contact list, the dolphin observers shall be able to find out the contacts of corresponding person in case of dolphin sighting within and near the DEZ or emergent occurrence of any unpredictable impact on dolphin. Prior to the commencement of construction activity, if dolphin is observed in the DEZ within the 30-minute period of initial scanning, the dolphin observers shall immediately inform the construction superintendent or relevant person through mobile phone or handheld transceivers to delay the commencement of construction activity within the DEZ until the dolphin left and the DEZ is continuously clear of dolphin for a period of 30 minutes. If dolphin is observed within the DEZ during construction works, the dolphin observer shall inform the construction superintendent or relevant personnel immediately through mobile phone or handheld transceivers to cease construction activity within the DEZ immediately. The dolphin observer shall continue to monitor the location and movement of dolphin. After the dolphin has left the DEZ and the DEZ is continuously clear of dolphin for a period of 30 minutes, the dolphin observer shall inform the construction superintendent that construction activities within the DEZ could be resumed. If dolphin is observed in close vicinity but outside the DEZ, the dolphin observer shall also inform the construction superintendent about the presence of dolphin. The dolphin observer shall remain in position and closely observe the movement of dolphin as well as searching for the appearance of any other dolphin within the DEZ. No matter dolphin is observed within or in close vicinity but outside the DEZ, the construction superintendent or relevant person shall inform all vessel captains involved in construction activities around the DEZ to pay special attention of the presence of dolphin in order to reduce chance of collision with dolphin. In case of injury or live-stranded dolphin being found within the DEZ, the dolphin observer shall immediately inform the construction superintendent to suspend construction activities within the works area around the DEZ and contact AFCD through “1823” marine mammal stranding hotline. - When dolphin is spotted by the dolphin observer near the fringe of the DEZ for DCM works, the dolphin observer shall inform the DCM construction superintendent on the appearance of dolphin. The DCM construction superintendent shall check the DCM operating level and progress. - In the case of DCM withdrawal, i.e. cement injection and mixing underway, the DCM construction superintendent shall instruct the control operator to stop rotation of the DCM rig(s) and to prepare lifting up the DCM rig(s) above the cement layer but below the seabed within the DCM column(s) to avoid bringing out the contaminants from the contaminated mud pit. - In the case of DCM penetration underway, the DCM construction superintendent shall instruct the control operator to stay alert and suspend the subsequent DCM procedures after the bottom level is reached. - When the dolphin observer found that dolphin has entered the DEZ for DCM works, in the case of DCM withdrawal, the action of lifting up the DCM rig(s) above the cement layer (but below the seabed) shall be completed within 1 minute and all DCM activities shall be ceased. - In the case of DCM penetration, the rotation of DCM rig(s) shall be ceased immediately. Monthly site inspection / audit during both daytime and night-time DEZ monitoring will be carried by the IEC jointed with the ET Leader and other relevant parties, to monitor the effectiveness of the DEZ implementation.